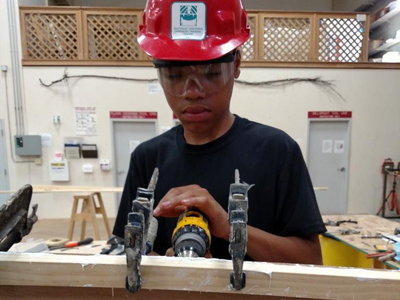 All Hands Boatworks, Inc., a Milwaukee youth development nonprofit, and the Southeast Wisconsin Carpentry Training Center (SEWCTC) joined together to conduct a boatbuilding “Builders Camp” for 24 urban youths from the metro Milwaukee region. The Builders Camp was hosted at the Southeast Wisconsin Carpentry Training Center in Pewaukee, WI. 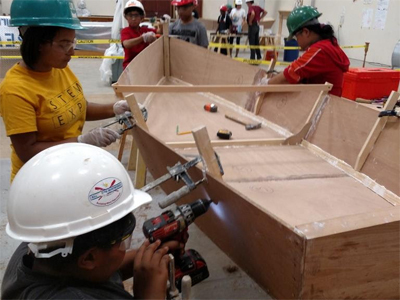 Instructors from All Hands Boatworks led the students (6th-9th graders) in the construction of four 12’ wooden skiffs over one week. SEWCTC Apprenticeship Program instructors led demos and hands-on activities, ranging from floor covering to virtual welding and pile driving.